Turkménistan. chant des femmes bakhshi. 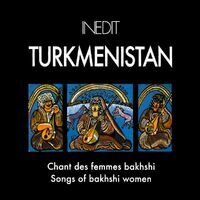 songs of bakhshi women. Nebaghdüydü nebgahban. extrait de/from "zuhra we tahir". Kim beler. extrait de/from "layla we majnun. Shaktem gulle. extraits de/from "shasenem we gharif"